Starring Margaret Qualley, Anthony Mackie, Danny Huston and Tom Payne. Netflix deserves a small measure of praise for investing in so much stylish, well-acted sci-fi content across TV and film, but isn’t it a shame that so much of it turns out a largely superficial pleasure? That’s certainly the case with IO, an initially enticing yet largely underwhelming character drama with genre trimmings. In a post-apocalyptic future, Earth’s atmosphere has become uninhabitable for humans, with what remains of humanity fleeing to a space station situated by Jupiter’s moon Io. Scientist Sam Walden (Margaret Qualley) is meanwhile one of the few remaining humans on Earth hoping to find a solution beyond abandoning home. 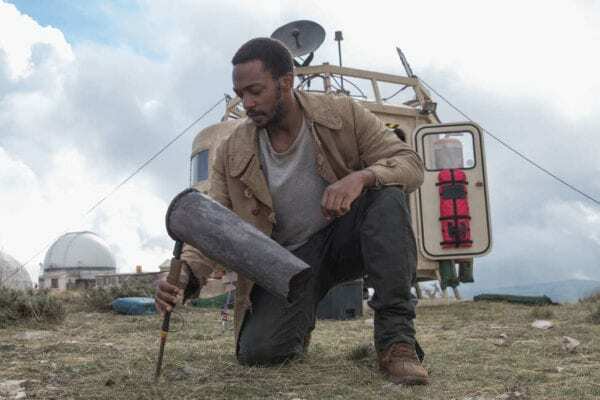 Her plans are thrown into disarray, though, with the arrival of Micah (Anthony Mackie), a man who aims to leave Earth on the final space shuttle headed for Io. It’s certainly a compelling enough hook, and IO‘s first act in particular relishes both André Chemetoff’s stately cinematography – with some impressive CGI flourishes given the obviously low price point – and Qualley’s solid screen presence. 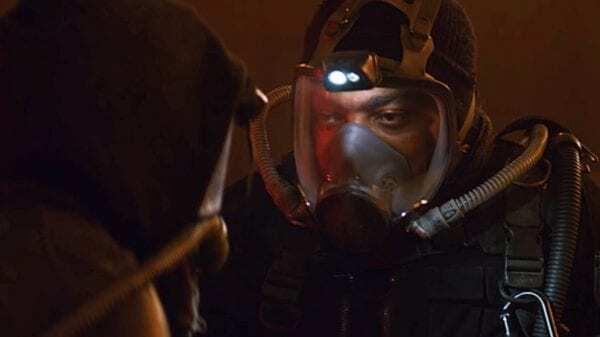 After a time, however, a film has to go somewhere, and even with the second-act arrival of Mackie’s Micah, it mostly paints in strokes both tediously broad and predictable. Is it much of a spoiler to say that there’s an inevitable romantic liaison between Sam and Micah, and that it takes the most well-traveled, widely telegraphed narrative path possible? 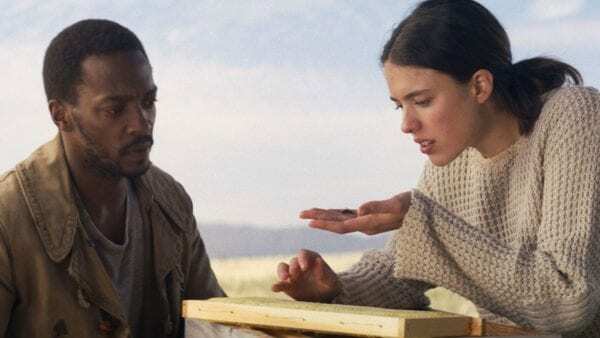 Qualley and Mackie do their best to sell the romance – which, in a landscape this lonely doesn’t really take much – but the sentimental climax ends up feeling unearned and totally at odds with the bulk of the movie’s more measured, mannered tone. Countless classic sci-fi movies have proven the benefits of a slow build, yet IO‘s glacial pacing is a huge problem here when director Jonathan Helpert finds himself unable to populate the lengthy, dialogue-free portions of the film with much meaningful at all. 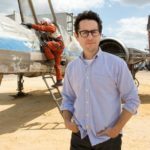 It doesn’t help that the sci-fi survival movie is a long-drained well, and the film’s laid-on-thick environmental hand-wringing fails to bring a new or interesting perspective to the table. And in an hilariously jarring choice, Sam’s far-flung boyfriend – with whom she communicates via e-mail – is named Elon. Go figure. 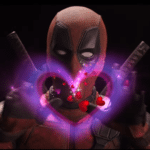 Some may admire the movie’s lyrical attempts to foreground how humanity’s greatest artistic achievements would be lost to time in the event of a calamity that required a speedy evacuation of Earth, but the film’s recitations of classic poetry largely come across as smugly self-satisfied above all else. In a movie with more lengthy shots of actors staring into the middle-distance than your typical Nicolas Winding Refn joint, it feels unavoidably conceited. 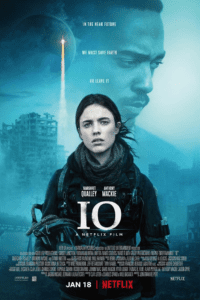 Neither worthy of being lumped in with some of Netflix’s lousier sci-fi offerings nor well-written enough to succeed as a low-fi survival drama, IO is a tough sell beyond the most voracious sci-fi fan keen to gobble up as much as they can get. The strong visuals belie an exhaustingly dull film which not even its talented leads can manage to fully prop up. It’s never fun to dunk on low-key sci-fi this well made, but ultimately the ponderous, overwrought IO is just a bit of a bore.